In AcclaimIP you can add and remove filters from the Refine Panel, and show by default only those filters that you use regularly. Filters can be added on the fly without having to reload your search results, so it is a good idea to load only the ones you use the most often to minimize the number of filters you see on the screen and minimize scrolling. Click the Manage Filters button (1) in the Refine Panel, and the Manage Filters dialog box (2) appears. Check and Un-Check the filters you want to see in your Refine panel. The filters you check will be available immediately without the need to refresh your search result window. You don't need to set preferences, AcclaimIP remembers automatically! 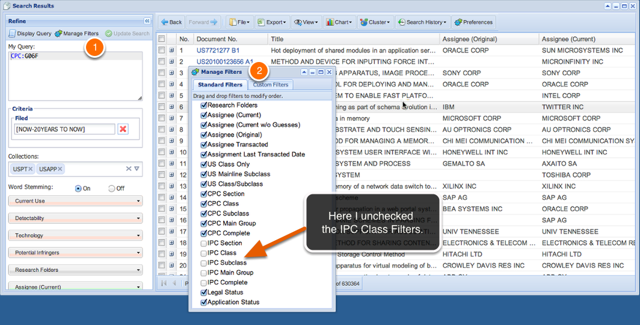 The next time you search, AcclaimIP displays the last-used set of filters. Filters based on custom data fields can be invoked in the Refine panel as well. Over time, the number of custom fields, and the number of corresponding filters, may grow to an unwieldy number. Use the Manage Filters window to show only the custom filters that you want to display for your current project. Click the Custom Filters tab (1) and select the custom filters you want to see in the Refine Panel. 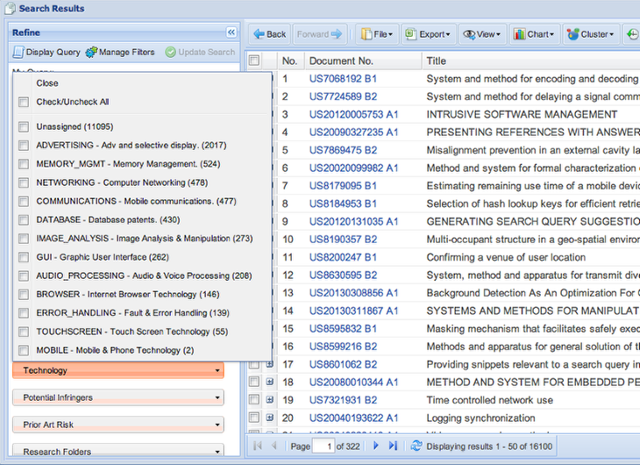 The filters are displayed as orange colored menu-buttons (2) in the Refine Panel. Custom Filters work identically to standard filters. Notice they are faceted (the counts) just like other filters. Next: How Do I Sort My Search Results?